The rise of building product imports brings both good and bad to Australia's building industry. David Wheeldon reports on a new campaign to ensure building products and components - no matter the origin - comply with Australian codes and standards. Untold quantities of sub-standard building products are being imported into and used in Australia. Often falsely branded, they range from small individual pieces of hardware to structural building materials and everything in between. As the amount of these imports grows, so too do the potential consequences for building practitioners: subsequent rectification costs, damage to reputation and threats to health and safety. For some time now, industry bodies and manufacturers have been gathering evidence that forms a troubling and growing trend. The most common example, says HIA managing director Shane Goodwin, is the increasing tendency for customers to source their own materials and request the builder to use them. "Whilst this can be a cheaper upfront cost to the owner, they are not aware of the compliance requirements and if they don't ask the right questions, the builder is then faced with little option but to decline to use these products," he says. A further problem is the lack of compatibility with local systems and the inability to source replacement parts in the future if failure occurs. "Internet purchasing by all players is on the increase and this appears to go hand in hand with products being sourced from overseas," says Goodwin. A major concern presently is that a builder has no way of assessing the properties of many products they are supplied. It's particularly difficult and costly to test materials like steel and timber and glass after they have been manufactured. This puts builders in a position where they can be misled by suppliers. Last month, for example, Fair Trading NSW issued a warning that hundreds of households may have hot water tanks - manufactured and imported from China - not approved for use in Australia which posed a serious risk to health and safety. The proprietor of solar installation business Solar & Bamboo Direct had been found guilty of selling non-compliant dangerous hot water storage tanks and making false and misleading claims. Many pundits agree there is less of a problem when a product is dramatically under-compliant, because the majority of their faults are visibly evident and would be noticed before use. A bigger concern lay with more subtly below standard products whose non-compliance can not be picked up by the naked eye. With no group currently responsible for collecting data on imported building products or checking their compliance when they arrive in Australia, there is currently no way of measuring the true extent of the problem. Ironically, it would seem easier to measure the compliant imports, such as the increasing number of materials brought in by credible Australian companies. These are also tipped to increase further as the domestic market comes under greater cost pressures. As Brickworks managing director Lindsay Partridge recently told The Australian newspaper, while residential construction used to be supplied by almost wholly Australian made products, "that's changing ¬ because of rising investment costs in the manufacturing sector." "The imports are gradually creeping up . . . It is no longer possible to reduce the costs under your control, to a point where it's cheaper than buying product overseas," he says. 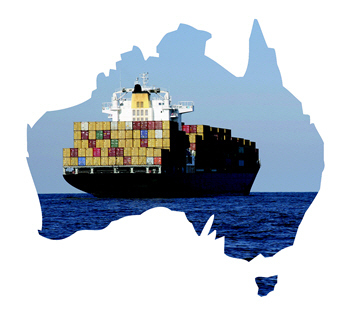 Australian manufacturers and industry bodies make it very clear they do not oppose cost-effective, quality imports; rather, it is the influx of non-compliant products they take issue with - and those locally produced. They say the inconsistent compliance regime has led to an uneven playing field between manufacturers that comply with standards and those that do not. "Manufacturers who do the right thing are being disadvantaged against those that neither invest in producing products that meet Australian standards nor programs to demonstrate compliance," says Goodwin. The residential building sector is taking a lead to address the compliance framework, with the HIA spearheading a campaign for a national building product accreditation scheme. "With more and more products being manufactured offshore, and increased access to these products by individuals, the need to focus on compliance has never been greater," says Goodwin. Even more important than the financial issues, he points out, is the potential cost to the health and safety - particularly in the case of structural materials, sanitary and electrical components. The HIA's key concern is that compliance and enforcement in Australia has not kept pace with changes to how or where products are manufactured or sourced. The Australian Competition and Consumer Commission (ACCC) recently explained in the Canberra Times that it has no direct role in enforcing the Australian Standards that apply to building products. The consumer watchdog did say it "enforces the Australian Consumer Law, which applies to the supply of goods and services generally and prohibits suppliers from making false representations or misleading or deceptive statements." "The ACCC will consider any concerns raised about possible false statements such as test reports or compliance reports," it states. Hence, the central plank of the response to the problem will be an industry led product registration scheme. "To be a success, a scheme will need the buy-in of government as well as industry, so it will require an extensive consultation process. But the extent of the problem means that we can't afford to ignore it. However, it is equally important that we strike the right balance between ensuring compliance and not creating additional red tape," says Goodwin. The building product certification scheme is aimed at giving designers, builders and other product specifiers a one-stop-shop to identify products that comply with relevant Australian standards and the Building Code of Australia. "They will be able to have certainty that compliance documentation for a product listed on the register is available from the manufacturer and that the manufacturer provides support and services for their products in the long term," says Goodwin. "More importantly, the scheme aims to provide a quick check system where builders and designers can rely on the scheme to do the checking, and give confidence to those using the products." The association is currently researching options for possible models including what logistical constraints will need to be addressed. Clipsal executive general manager Damien Cummins said the company’s greatest concern regarding non compliant electrical products is the quality and safety of the installation in people’s homes and workplaces. The residential building industry is being placed at risk when builders, or their subcontractors, install inferior or non-compliant electrical products. This can also impact on commercial buildings and across the whole building industry. We felt so strongly about the issue we launched an industry awareness campaign in 2011 called Don’t Risk It! We wanted to protect our industry. We lobbied electrical industry organisations and independent electrical trade media - to get them onside and provide credible articles and commentary for publication and advertising. Electrical wholesalers promoted the campaign through posters and point of sale material. Clipsal Sales Reps advised Electrical contractors, advising them of the liabilities. The support from electrical wholesalers has been unanimous and our Don’t Risk It! website has received around 10,000 hits since August, 2011. The electrical industry has now adopted the campaign material for general use. Our message to builders is to check the authenticity of products being installed and demand known products and brands on your sites. Builders should also demand that electrical contractors you engage in, purchase from trusted wholesalers, refuse to allow product substitution and only use electrical contractors you can trust. CSR Building Materials group, manager business development, David Linaker, reports serious concern with imports such as plate glass and glass wool insulation. The problems with non-complying and inferior insulation were highlighted with the government’s ‘failed batts’ scheme. There are also developing concerns with imported plasterboard and light-weight concrete products. Engineered Wood Products Association general manager Simon Dorries says the risk we run, along with other product sectors that complain of the same, is sub standard buildings, costing the reputation of architects, profits to the builders. Weak plywood, well below the indicated strength had become ‘’far too common’’. ‘’A lot of the products from China are very cheap and if you are able to increase your profit by buying a $2 stamp [saying goods were certified] then that can be very tempting,’’ he said. ‘’The problem is if you have something that looks identical to the real product and it can be mistaken - the other way is when something is blatantly misrepresented - that happens too often.’’ In 2011 the wood association tested numerous samples of imported decorative plywood for wall lining and particle board used in flat-pack kitchen cabinets and found emissions of formaldehyde were two to four times higher than Australian limits. Australian Window Association executive director Tracey Gramlick says an increasing proportion of windows and doors being put into Australian buildings fail to meet the minimum standards regulated through the BCA. There are up to 1000 windows in Western Australia and a growing number along the east coast that we know about now through our in-house Independent Inspection and Dispute Resolution services and our relationship with building authority, surveyor and legal partners. Many of our members get pull out and replacement jobs. The main issue is the non-policing of compliance. The standards are there, the regulation is there, our members all have tested and accredited product ranges and consistently lose business given the higher cost to comply. HIA is currently conducting research into the level of the problem, including a survey of building and manufacturing members. As the problem gets more public attention, HIA continues to be contacted by members of the industry who have encountered non-complying products in the marketplace or with consumer procured products, but have until now felt they had nowhere to go. While this supports the rationale for the scheme, it also confirms with us the extent of the problem. Yet to commence but expected to occur in mid-2012. Several groups including the Australian Window Association (AWA), Engineered Wood Product Association of Australia (EWPAA) and ACERS all operate certification schemes for their members and these are well managed and important schemes to recognise. HIA is working with these groups to gauge how the schemes can complement each other. HIA has already prepared a number of factsheets which are readily available on the web to provide a broader understanding of compliance issues. As the development of the product register progresses, HIA will increase the communication with industry to encourage use of it by builders and certifiers. An overview of the campaign and key documents are available online at http://hia.com.au/media/Industry-policy/Building-Products.aspx and further updates will be added as the project progresses. BlueScope Steel recently warned that the last 18 months has seen an increase in aluminium/zinc alloy coated steel being imported into Australia. They have questioned whether the imported product meets the relevant Australian Standard. The imported material is being positioned to compete with, but is not necessarily equivalent to, BlueScope’s manufactured product including Zincalume steel and Truecore steel, both of which conform to AS1397. The manufacturer warns that coating thickness and base metal thickness of products made to foreign standards may not meet the minimum requirements set out by AS1397, which may result in reduced durability and structural design performance.